The Los Angeles area is home to a number of tall ships - those square and classic-rigged sailing vessels that look so majestic on the water. You know, the ones where you instantly think - pirates! You often see them sailing off the Southern California coast and you may wonder who is out there on those historic barques. Most of the time, the answer is local teenagers. The majority of tall ships in the Southland and around the country are operated as floating classrooms where young people in middle school and high school learn not just sailing, but life skills and teamwork. When not out on the water full of kids, the ships make impressive landmarks that can be seen dockside in their local ports. Some can only be admired from shore. Others offer public tours and cruises on the weekends. In addition to the tall ships stationed at each port, the local ships visit each other for special events like the Tall Ship Festival in Dana Point and some Holiday Boat Parades. LA is also a port of call for several touring classic ships that offer public visits, adventure cruises and battle sails. Click through the following pages to view photos and details of tall ships based in Southern California ports as well as tall ship events and visiting ships. In Long Beach, there's the three-masted schooner American Pride, operated by the Children's Maritime Foundation. The ship was built in 1941 with only two masts and spent her first forty years as a fishing boat on the east coast. First christened the Virginia, she was renamed the Lady Blue in the 1960s and the Natalie Todd in the 1980s after a reconstruction that added the third mast. The American Heritage Marine Institute acquired the ship in the 1990s, re-christening it the American Pride. Notable: American Pride has distinctive "tan-bark" (red) sails that make it easy to recognize. The tall ship SSV Tole Mour is owned and operated by the Catalina Island Marine Institute(CIMI)/Guided Discoveries. The SSV designates a "Sailing School Vessel," and this ship is currently operated as a floating classroom for teaching tall ship sailing, marine sciences and team building. According to the CIMI website, the Tole Mour was custom built in the 1980s as a floating medical facility to serve the health needs of the outlying Marshall Islands. "Original configuration included medical, dental, and opthimalogical offices and a fully equipped, compact surgery. Oversized air-conditioning and water making equipment was a must; crew comfort was considered essential, as the vessel would serve long hauls of many months each in the tropics." After the government decided to provide their own fleet of medical boats, the Tole Mour was used for a while for youth programs in Hawaii, then sold in 2001 to Guided Discoveries for the CIMI Tall Ship Summer Sailing Program. It is the largest working schooner in the US, although there are larger tall ships of other types, such as the windjammer Star of India and the frigate HMS Surprise in San Diego. The CIMI summer youth programs are not only school-based, but are also open to young people from anywhere in the world. Notable: The ship is used for marine life education and has a number of on board aquariums and touch pools. In San Pedro, the twin brigantines, the Irving Johnson and Exy Johnson are operated by the Los Angeles Maritime Institute. Youngsters in the world of tall ships, the two ships were built in 2003 using both traditional and modern ship-building methods. Like most other tall ships, the Irving and Exy Johnson are also primarily used for youth education programs and are sometimes off traveling to other ports. When they are home, they are not open to the public, but the two tall ships can be seen at Berth 78, at the end of 6th Street near Ports O'Call Village in San Pedro. Notable: The twin ships are Official Tall Ship Ambassadors of the City of Los Angeles. The LA Maritime Institute also owns the topsail schooner, the Swift of Ipswich, which is currently undergoing reconstruction. In Orange County, Dana Point has the only harbor deep enough to berth a tall ship since the Irvine Company reconfigured the Newport Harbor in 2008, so Dana Point has three tall ships to make up for the deficit in the rest of the county. The Ocean Institute operates the Pilgrim, a replica of an 1825 Boston brig that brought goods from Boston to Alta California, eventually lost in a fire at sea in 1856. The ship was immortalized in the novel Two Years Before the Mast by Richard Henry Dana, Jr. The Pilgrim is used as a living history education program and can be visited by the public most Sundays at the Ocean Institute. It is also used during the summer for maritime-themed plays and musicals. Notable: The Pilgrim portrayed the ship Amistad in the movie of that name. The Ocean Institute's second historic ship, the Spirit of Dana Point, is a replica of a 1770's privateer (AKA pirate ship) from the American Revolution. The ship was built using original plans and traditional methods and took 13 years to complete. The Spirit of Dana Point sets sail regularly for various public programs including whale-watching excursions and pirate battles. Visit www.ocean-institute.org for the event schedule. Notable: Formerly known as the Pilgrim of Newport. The Curlew is a privately owned tall ship based in Dana Point. Built in the 1920s as a pleasure schooner, she also won her share of yacht races. The Curlew is a much sleeker and more modern-looking incarnation of a tall ship, but as an original wooden-hulled ship from the 1920s, she's actually a bit more fragile than some of the steel-hulled replicas in the area. Notable: The Curlew was donated to the US Coast Guard in 1940 and served as a sail training ship and coastguard patrol vessel during WWII. The 136-foot gaff topsail schooner Bill of Rights was built in South Bristol, Maine in 1971 and spent many years plying the waters of the east coast and down to the Caribbean with youth crews and tourists aboard. In the 1990s it was acquired by the Los Angeles Maritime Institute in San Pedro for their youth programs. When the Irving and Exy Johnson were put into service, the Bill of Rights got an overhaul and moved to Channel Islands Harbor, Oxnard as part of the American Tall Ship Institute. In 2013, the ship was sold to the South Bayfront Sailing Association is now at home in the California Yacht Marina’s excursion dock in the Chula Vista Harbor on south San Diego Bay, where she is used for on-the-water educational programs. Notable: The Bill of Rights was the lead tall ship into New York Harbor for the 1976 bicentennial celebration. 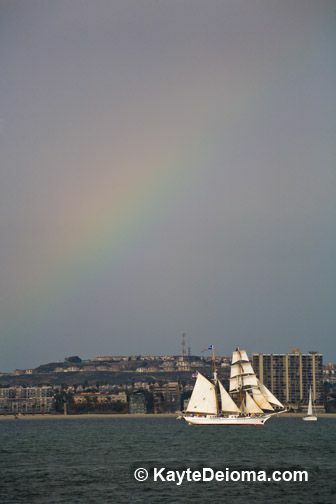 San Diego has four resident tall ships. Pictured here is the Star of India, a seaworthy museum ship located at the Maritime Museum of San Diego. She is the grandest old lady among the tall ships on the west coast. Originally dubbed the Euterpe, the Star of India was built as a full-rigged ship on the Isle of Man in England. She was one of the first iron-hulled ships. After sailing merchant routes from England to India and emigration trips to New Zealand, the ship was re-rigged down to a barque to become a salmon hauler in Alaska and California. The Star of India was declared an American ship by an act of Congress. The Star of India is the oldest ship in the world still sailing regularly (every November she's taken out for a birthday sail) and is both a California and US National Historic Landmark. Notable: The Star of India sailed around the world 21 times. Review of the Maritime Museum of San Diego on sandiego.about.com. Also located a the Maritime Museum of San Diego is the HMS Surprise, the replica of a British 24-gun frigate created for the Russel Crowe movie Master and Commander: The Far Side of the World. Prior to its incarnation as a movie star, the ship was originally built in 1970 as a replica of the Royal Navy frigate Rose. The Surprise came out of movie retirement to play the HMS Providence for the film Pirates of the Caribbean 4: On Stranger Tides. Notable: Despite being called the HMS Surprise as a tribute to the Royal Navy ship she portrayed, the Surprise doesn't actually have a Her (His) Majesty's Ship designation since she doesn't have a royal warrant. The youngest tall ship at the Maritime Museum of San Diego is the topsail schooner, Californian, a replica of revenue cutter, a historic law enforcement vessel from California Gold Rush times. Designated the Official Tall Ship of California, the Californian regularly offers adventure sail opportunities. Notable: Californian was launched at the 1984 Summer Olympics in Los Angeles, CA. Notable: So far, what's notable is that there is so little information available about the history of this beautiful ship. Most years the two tall ships the Lady Washington and the Hawaiian Chieftain visit Southern California from their home in Washington State. This usually happens in the fall or winter when it's cold in Washington. When the two ships are in town, they offer adventure cruises and battle cruises for the general public. Notable: In 1788, the original Lady Washington sailed around Cape Horn and became the first American vessel to make landfall on the west coast of North America. She was also the first American ship to visit Honolulu, Hong Kong and Japan. Notable: The steel hull of the Hawaiian Chieftain is shaped like the Spanish explorer ships that visited the west coast of the US in the 1700s. Check the touring schedule for the Lady Washington and Hawaiian Chieftain at www.historicalseaport.org. The Channel Islands Harbor Tall Ships Festival takes place each June in Oxnard, CA, south of Santa Barbara. The festival includes a Pirate Camp, Civil War Encampment and food vendors on land, as well as ship tours and battle reenactment sails. The event included a Pacific Tall Ships Challenge Race every third year. The Tall Ships Festival in Dana Point, in southern Orange County, CA is an annual weekend event each September. Tall ships from around Southern California converge for three days of rollicking seafaring fun. Interactive living history encampments and musical performances on land complement the pirate battles and other adventures at sea. A sunset parade of tall ships is one of the highlights. The festival is organized by the Ocean Institute. For current information visit www.tallshipsfestival.com.